Today was the day we decided to do the longest, most challenging hike on our agenda while in the Moosehead Lake area of Maine. 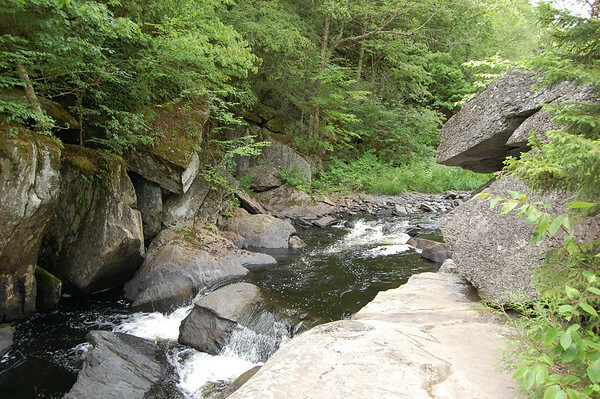 About 20 miles from Greenville (it seems like everything is 20 miles away), is a slate gorge created by the West Branch of the Pleasant River. The gorge is four miles long and the river falls a total of 400 feet through the canyon creating waterfalls, cascades, and pools. This gorge is called Gulf Hagas and was designated a National Registered Natural Landmark by the National Park Service in 1968. 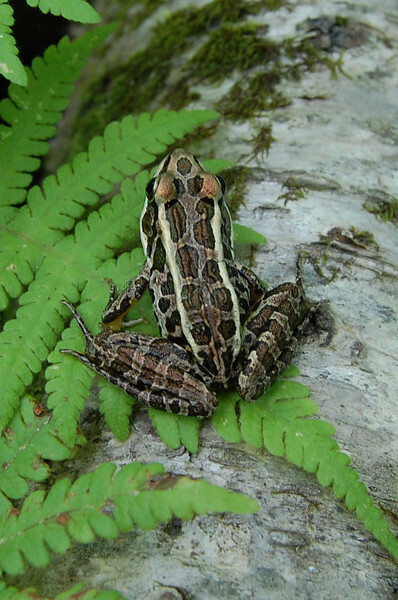 Though it is federally owned and part of the Appalachian National Scenic Trail corridor, it sits in the middle of a privately owned working forest. We packed our backpacks heavier than usual with rain gear, extra socks, water shoes, and towels. We got our usual late start and that wasn't a good thing for this 8-mile hike. From the center of Greenville, we took Pleasant Road which goes toward the rural airport. After about two miles, it changes to gravel and the road name changes a couple of times. After a total of 12.5 miles we reached the Hedgehog Checkpoint. Because access is through the privately owned forest, they charge a fee. It's $6 per person for Maine residents and $10 per person for non-Maine residents. At the checkpoint, you can buy a map and get information. I had already downloaded and printed the map/brochure from this web PDF. From the checkpoint, it was another six miles to the Gulf Hagas trailhead parking area, a total of 18.5 miles from Greenville. While Linda used the primitive restroom, I scanned over the kiosk for any additional information I didn't already have. Now, I figured this 8-mile hike at 2 m.p.h. would take four hours plus we could add an hour for lunch and stopping for pictures. The gate attendant said the loop would take us about three and a half to four hours. Well, the kiosk said "Don't underestimate this hike! It will take six to eight hours to do the 8.2-mile loop." Okay, so it was almost 1:00. Six hours would be okay. Eight hours would not. The sun is setting about 8:15, and we certainly didn't want to be in the woods or driving on those remote gravel roads after dark. We wouldn't be able to stop at the highlights for very long. Knowing we would have to walk through a small river two tenths of a mile in from the parking lot, we wore our water shoes and carried our hiking boots. 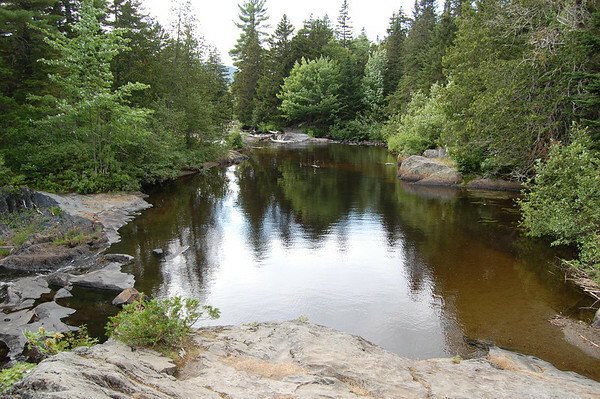 Depending on the season and weather, that river can be ankle deep, knee deep, or thigh deep. It was shin deep today and not as cold as we thought it would be. On the other side is a handy log to sit on and change shoes. The young man on the log above was hiking almost the entire length of the 2,175 mile Appalachian Trail (AT). He started at the Maine end on Mt. Katahdin, 84 miles from here and is hiking to his home in Georgia. The first 1.4 miles of the Gulf Hagas Trail is on the AT. After the Appalachian Trail branched off from the Gulf Hagas Trail, we crossed Gulf Hagas Brook. That's where the Registered National Landmark plaque is and where the trail splits. To the left is the more difficult Rim Trail and to the right is the easier Pleasant River Tote Trail. 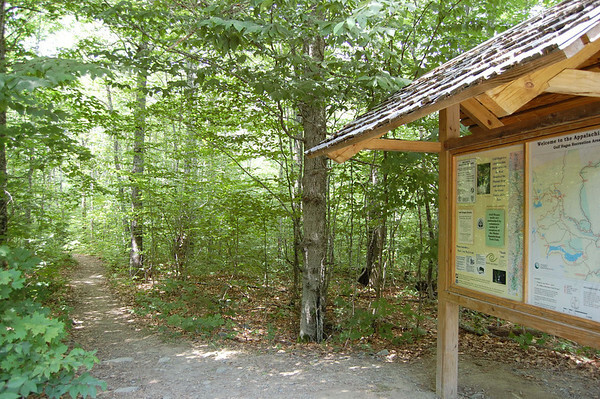 From parking lot to Rim Trail to where it connects with the Pleasant River Trail at the end and back to the parking lot is 8.2 miles. However, there are two cut-offs along the way to shorten the hike if you don't want to do the entire loop. Of course, the Rim Trail was the more scenic and, in fact, there really isn't much reason to do the Gulf Hagas hike unless you do at least the last half of the Rim Trail. Not very far into the Rim Trail is a small, pretty waterfall. 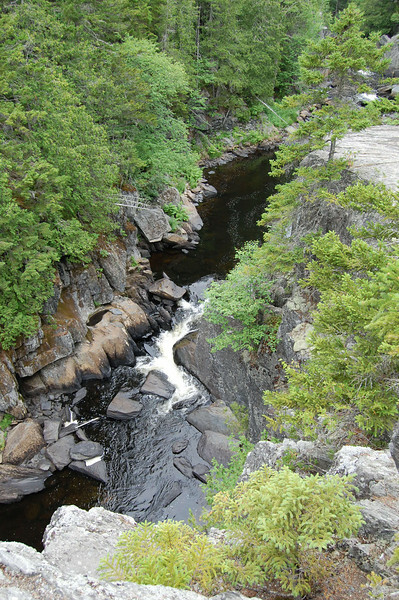 Just beyond that was a sign to the first of the named falls - Screw Auger Falls. I took on the job of doing video today. Sorry, I'm not nearly as good at narration as Linda. 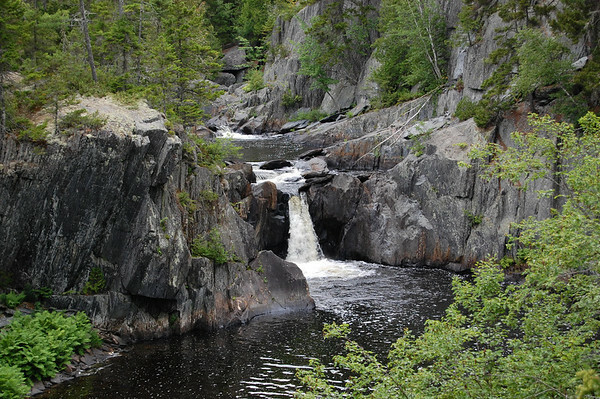 But here is the video at Screw Auger Falls. 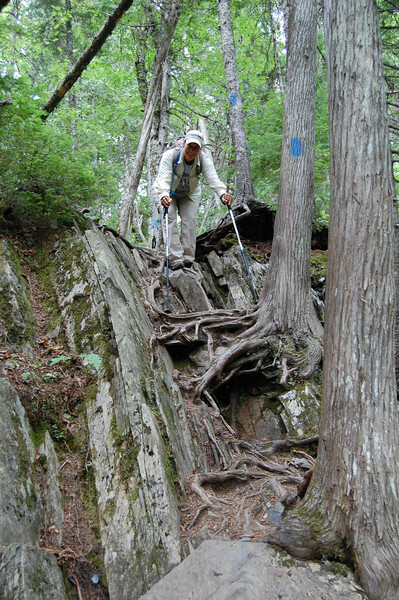 Now, one of the things that makes the Rim Trail so difficult is the short, but steep, climbs and descents. And "Rim" trail is a bit of a misnomer, as the trail, especially the first half, rarely goes along the rim of the gorge. 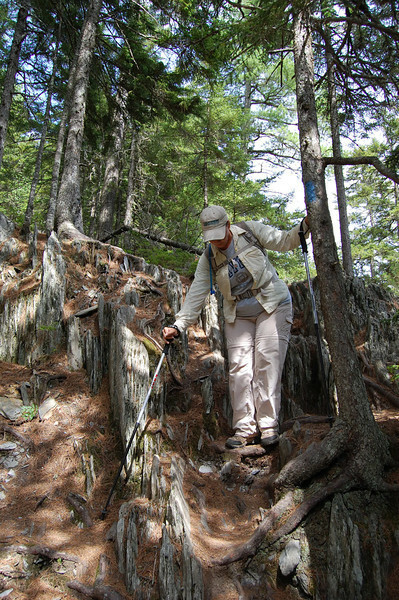 Usually, there is a steep downhill side trail to the river and then a tiring climb back up to the main trail. This video of Linda climbing back up from the Screw Auger Falls viewpoint gives you some idea. 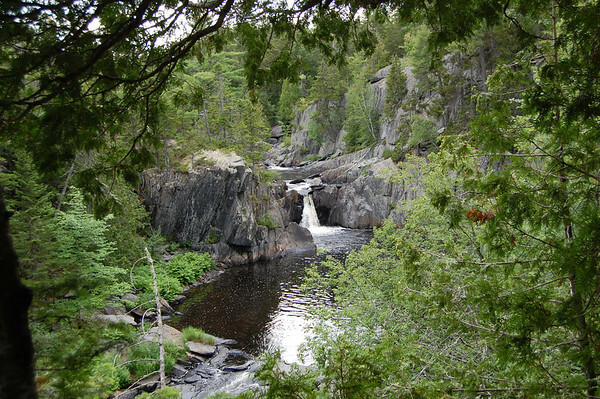 We skipped the next side trail which was 200 yards to Lower Falls. 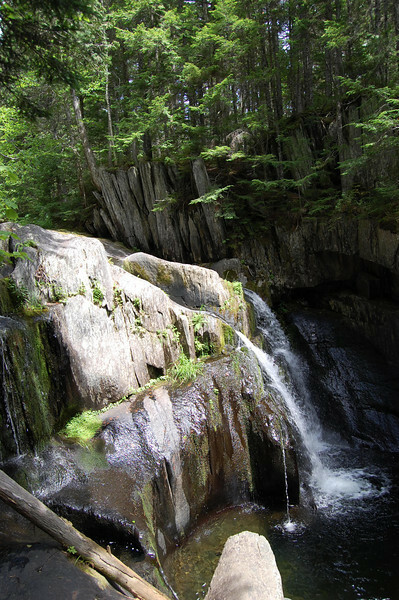 From Screw Auger Falls, for the next mile to a mile and a half, it's basically a hike through the woods with ups and downs over roots and rocks. In that section, the trail rarely gets to the canyon rim and when it does, it's hard to see anything through the trees. 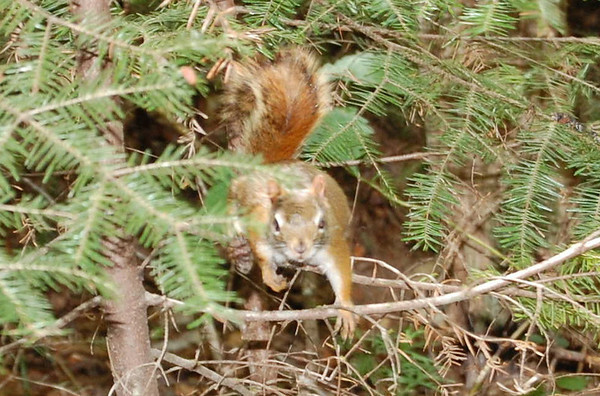 and a couple of these adorable little red squirrels. That one, in particular, was very curious. We eventually reached the first cut-over to the easier trail, but we weren't too tired and we hadn't seen much of the gorge yet, so we continued. About a half mile later, we walked down a side trail to the "Jaws". 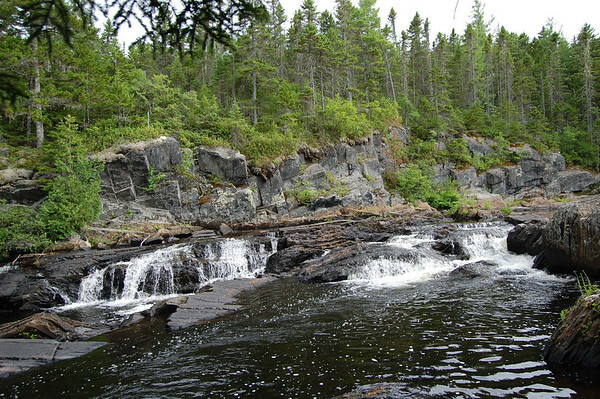 There, we sat on the rocks by the water and had our lunch to the sound of the flowing water. After lunch we continued on. This is a view of another part of the "Jaws". 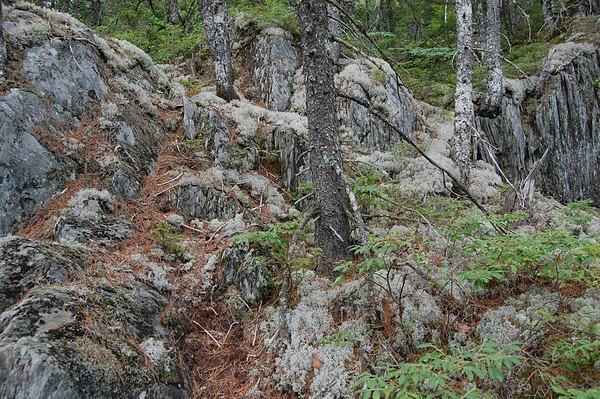 Back in the woods, we went through areas that had this fairy-tale-like light-colored moss. This trail certainly had some character. It's designated as "difficult", and with its constant ups and downs, it becomes quite strenuous after awhile. 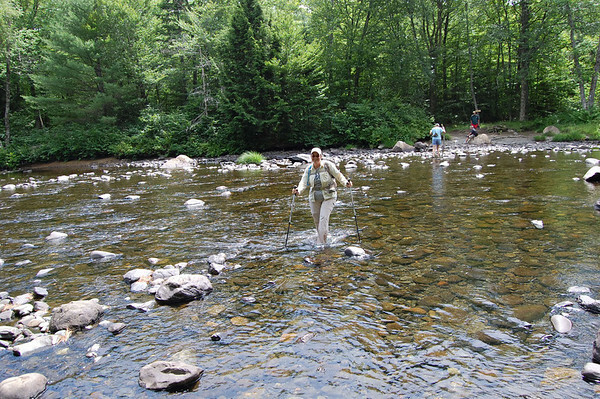 During this stretch, Linda decided she wanted to demo the use of her hiking poles. So I put six short videos together and she does some narration in there from time to time. Wow, she still seemed quite happy at that point. Soon, we reached a sign for a side trail to Buttermilk Falls. By then, I was taking off my heavy backpack before descending. And Linda was sending me down to see if the view was worth her making the trek down and then back up. Ultimately, we both went down to Buttermilk Falls for a quick look. We climbed back up to the main trail, and it was just a short time before we reached the second cut-off to shorten the hike and go back via the easier trail. It was tempting, and I'm sure Linda would have done it had I offered the option. But we still had a couple more waterfalls to see, and I was determined to finish this hike like we set out to do. After that, the trail started to track more along the rim of the canyon and we had some better looks. At the end of the video, I threw in "I don't do ledges". I wasn't nearly as close to the edge of the cliff as it looked. 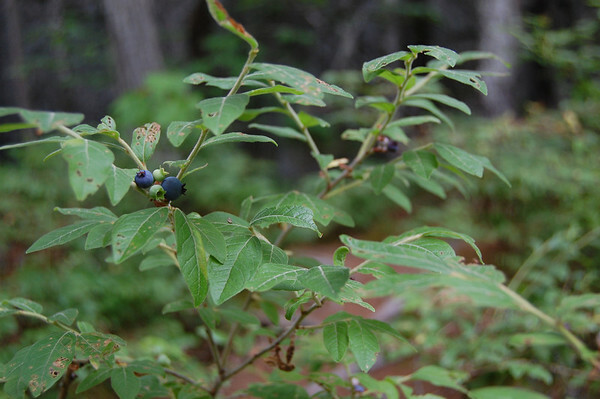 Now one of the bonuses of this hike is that there are blueberry bushes everywhere along the last part of the Rim Trail. Some weren't quite ripe yet and a bit tart, but as this next video shows, we found some sweet ones. Soon, we were back down to the river's edge for another nice view. This shot is looking downriver. Next, we came to an overlook for Billings Falls. 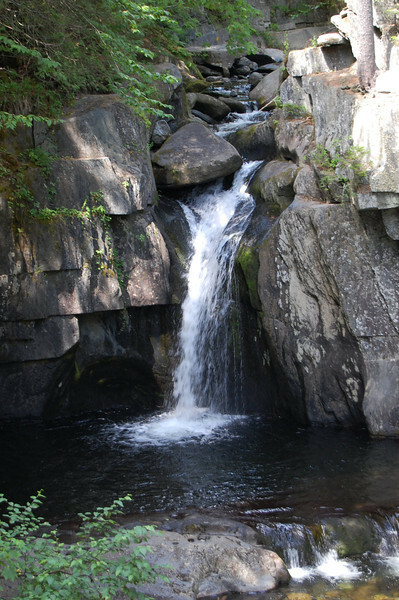 A very short distance from Billing Falls is our last named waterfall of the day - Stair Falls. And here is the video to go with that one. 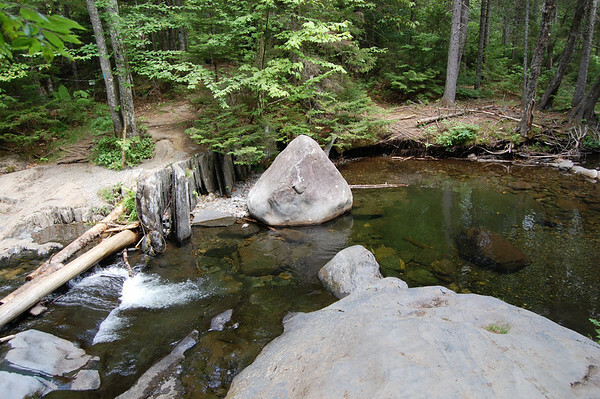 Shortly after Stair Falls was the end of the Rim Trail. All our body parts were aching, but we still had the four-mile return trip to go. We decided to rest for a short period. By that time, Linda was not nearly as happy as she was earlier. I had to cut her off in that video. She had just checked the time (5:20) and she was starting to say "If we go at the same pace going back, it will be 9:30." Needless to say, we didn't rest as long as I had hoped. Darkness was a bigger issue than being tired. 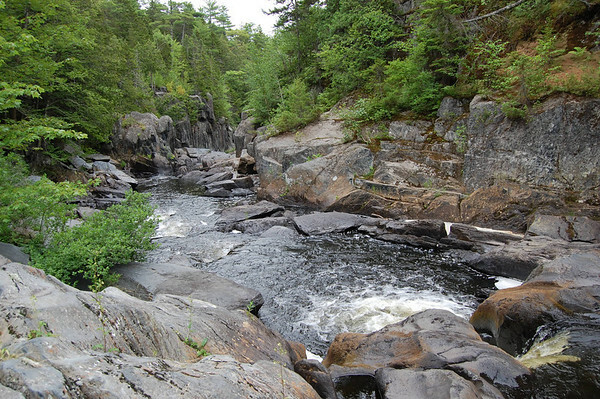 We jumped on the Pleasant River Tote Trail going back. It's a pretty straight trail going back through the woods. There are split logs for walking over the muddy areas as you can see in this final video. 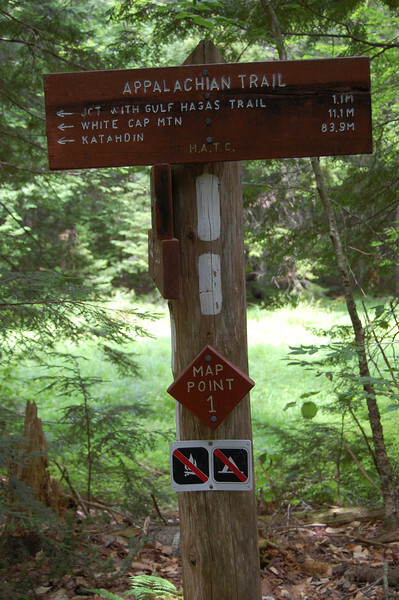 The Maine Appalachian Trail Club maintains the 267 miles of the AT in Maine, including the Gulf Hagas trail. We want to thank them for their service. I tried to set a pretty rapid pace for the return to make sure we got back to the Jeep well before dark. I was worn out and my shoulders were killing me, but we couldn't dilly-dally. Linda kept up for the first third of the way back, but her body just wouldn't let her keep up the pace. 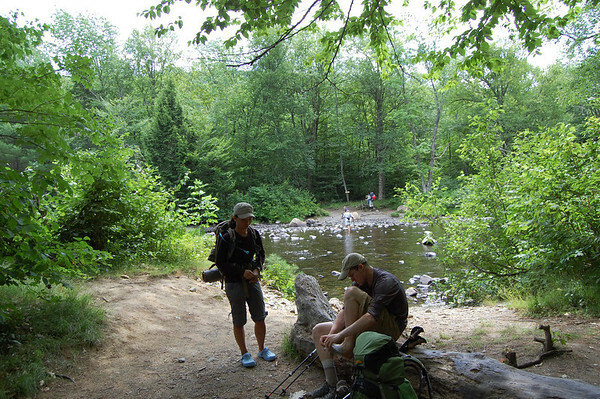 It didn't help that the mosquitoes were much worse on the return trail which was deeper in the woods. Each landmark - first cut-over, second cut-over, junction with the Rim Trail and Appalachian Trail - was a welcome sight. We dragged ourselves over that last 1.2 miles to the river crossing where we sat down and changed back into our water shoes for the ford and the last .2 miles to the parking lot. Whew. It took us two hours to get back making our total time on the trail 6.5 hours. The kiosk was right, and if we had spent our usual times at the waterfalls and overlooks, and gone at our usual pace on the way back, it would easily have been 8 hours. But we saw the whole Gulf Hagas gorge, got some great pics and videos, and have the sense of accomplishment of getting it done. We got back to the Jeep about 7:20 which gave us a little less than an hour to get back to civilization before the sun went down. We had to stop at the checkpoint to turn in our permit so they knew we made it out of there, and then we did our 20 - 30 m.p.h. on the gravel road back to Greenville. Okay, in summary. 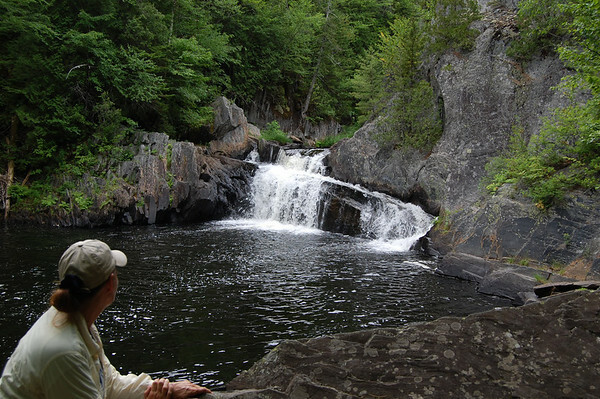 Gulf Hagas is referred to as the "Grand Canyon of the East" or the "Grand Canyon of Maine". 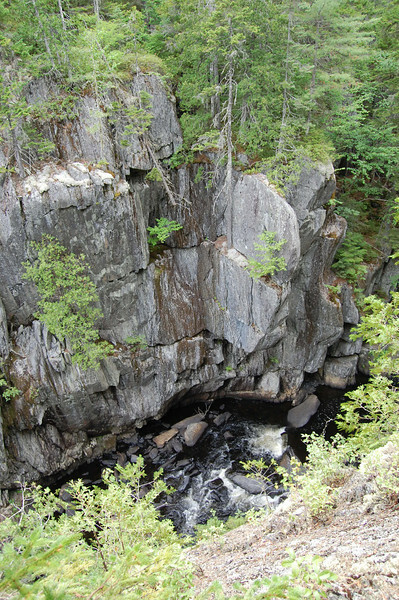 Well, it may be Maine's greatest canyon, but any comparisons to the Grand Canyon are just way off base. Don't believe the hype. We've seen deeper canyons in Ohio and New York. Now, with that said, the Rim Trail of Gulf Hagas is a challenging hike, with excellent scenery (especially the last third). But it may be the most difficult three-mile stretch we've done to this point. I don't recall as many high step-ups or grabbing as many trees or roots before, and certainly not in such a short hike. We've done longer hikes and hikes with much more in elevation change, but at least there were some gradual grades and distance between tough sections. Of course, we're not young whippersnappers anymore, and certainly not in the hiking shape we were in when we were out west in Utah. Had we known how we'd feel after the hike, we may not have done it. But I'm glad we did.